Want to build relationships and share good times with fellow enthusiasts? Let the Sports Car Driving Association get you there. In today’s business environment, attracting and keeping clients and associates is more important than ever. Investments in client retention show great returns and employee appreciation events move the needle reducing turnover and helps retain your most valuable assets. Why should I consider a SCDA group event? Share the experience, create a lasting memory. Not everyone golfs, but everyone drives. Team Building. Employees are a company’s greatest asset. Show them they are appreciated. Marque specific events. Ideal for automotive dealer and suppliers with a shared passion for a brand. Value added options. Personalize your event with special services for the greatest impact and fun. Client appreciation and relationship building. Imagine your next sales call after a day at the track together. Let SCDA classify driver’s by experience, have a dedicated 4-session run group or reserve up to a full day for your group. I want to bring a group, what is included? Discounted group pricing. Pay for your group or pass on the savings to your guests, group discounts are substantial. Premier paddock space. Put your group as close to the action as possible with reserved paddock space just for you. Concierge tech inspection. Bypass the inspection line and let us come to you. Designated instructors for Novice class drivers. Work with your own driver coach all day. Group photograph. Let our photographer create a lifetime memory with a group photo. Custom signage available to add excitement and a branded premium feel. Custom merchandise. Leave with your own logo on a piece of SCDA merchandise. Arrive and Drive. No track car? No problem. Drive one of our Spec Miata racecars for the day. Custom presentations and meeting space. Take a few minutes to talk about why you are all there together. Guest Speaker. Let us cap off your day with a tailored talk with one of our talents or one of yours. Full Day Experience. The track is yours for the day. Deliver the most impact possible. Getting started is easy. Contact the SCDA to pick a date and a racetrack and begin building your experience. How can I connect with everybody at a SCDA event? 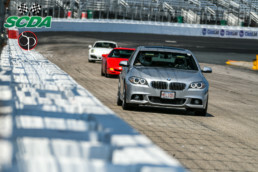 In addition to group events, the SCDA offers title sponsorship packages to reach the entire audience at the track on a given day. Sponsors can make a lasting impression with SCDA Primary and Associate level event specific sponsorship packages. This service has proven to be a unique and exciting way to maximize your advertising budget, and have a blast at the same time! Please download the Event Sponsorship PDF to see how far your advertising dollar can go. 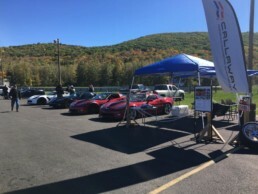 “Advertising Adrenaline” – sponsorship of an SCDA event. Please contact us for availability of either the Primary or Associate level event sponsorship packages.